The Para-Wing is Paratroopa's unlockable kart in Mario Kart: Double Dash!!. 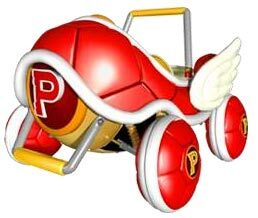 It's generally Koopa's kart with a red painting, wings on the side, and "P"'s replacing all the "K"s. It is a lightweight kart and is unlocked by completing Star Cup in 50cc. 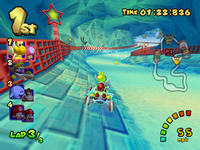 The Para-Wing shows a very low top speed, being tied with the Goo-Goo Buggy and Toadette Kart, making it one of the slowest karts in the game, and it has very high acceleration as well. Also, like the Koopa Dasher of Koopa Troopa, it's slightly tougher than other lightweight karts, being able to rival the weight of the medium weight Bloom Coach kart, but the kart is more prone to bouncing than the Goo-Goo Buggy and Toadette Kart. With its five star acceleration stat, the Para-Wing has the highest acceleration of all the lightweight karts, beating even the Goo-Goo Buggy and Toadette Kart. This page was last edited on March 6, 2018, at 20:52.